In February, Schools Minister Nick Gibb gave a welcome call to action about SEN\D music provision. He states that ‘It is important that all pupils have the opportunity to participate in the arts. That funding should support all pupils, whatever their background, whatever their family’s income, and whatever particular special needs or disabilities they may have. No child should be excluded from music because they have physical disabilities or other special needs.’ In this speech he also talks about the excellent work the One-Handed Musical Instrument Trust is doing to remove the barriers to music faced by physically disabled people. Not long after, OpenUp Music received an RPS Award for their South West Open Youth Orchestra, which was celebrated as a landmark moment in music education history and a sign of progress. SEN\D is a priority at Sound Connections, and we are currently on a fascinating journey with a number of organisations who are leading the way with innovative initiatives. On behalf of OpenUp Music we are creating a feasibility study for the National Open Youth Orchestra, the world’s first disabled-led/inclusive national youth orchestra. We have been consulting with organisations and individuals across England through online surveys, roundtable meetings and interviews. We are one of the partner organisations for Essex Music Service’s ‘A Bright Future for SEN\D Music in Greater Essex’, a project bringing together all special schools in Essex, Southend and Thurrock to improve musical opportunities. 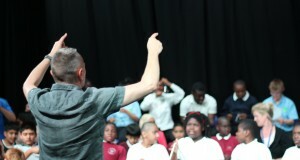 As part of this project Sound Connections associates Graham Dowdall and Roshi Nasehi have provided training and have been working with teachers and music tutors in special schools, focusing on inclusive singing and music making. Most recently we have been commissioned by Bournemouth Symphony Orchestra (BSO) to act as external evaluator for their new Change Makers programme. Change Makers is an Arts Council England (ACE) fund to support Black, minority ethnic and disabled leaders to develop their leadership skills by undertaking a senior leadership training and development placement. BSO’s project involves a collaboration with James Rose, a future artistic leader who uses a head-baton to conduct. The placement will provide James with mentorship and the opportunity to create, curate and conduct a disabled-led ensemble. The aim is also to catalyse cultural change across the organisation in relation to disability equality. BSO is the only orchestra and the only disabled-led music project to receive funding from the scheme.